The capital city of California, Sacramento is also one of the state's biggest and best places to live. It's one of the fastest-growing cities in the entire US and well known for its thriving contemporary culture and diversity. In terms of the arts, there are few places better to be than Sacramento, with the city boasting several major museums, a thriving music industry, many different galleries, and, most impressively, one of the largest assortments of community theaters in the United States. There are plenty of great comedy hotspots to be found all around Sacramento, offering a myriad of laughs and side-splitting experiences for comedy fans of all ages. No matter what kind of comedy show you want to experience, you’ll be able to find it in this city. Here are some contact details and overviews of a few of Sacramento’s best-rated comedy shows and locations. For all kinds of comedy, the Sacramento Comedy Spot is a super club to check out. This location runs shows six nights a week and varies between improv, sketch, and stand-up comedy regularly, ensuring there's always something new and different to enjoy. Comedy show classes are also held here on a monthly basis at the Comedy Spot's comedy school, and various special events and unique comedy shows like improv battles and LGBTQ comedy nights can also be enjoyed at this club. The biggest and best names in comedy have all appeared at the Punch Line in Sacramento, including the likes of Dave Chappelle and Bobby Lee. This spot has won awards for providing some of the most hilarious shows and biggest laughs of the city, and the Punch Line always has an exciting schedule, with dozens of recognizable talents appearing at this venue each and every year. For guaranteed laughs and sightings of some of the nation’s greatest talents, the Punch Line is the place to be. With both professional and amateur comedians appearing in shows six nights every week, Laughs Unlimited really lives up to its name. All kinds of comedy shows and showcases can be enjoyed at this location, which also serves great food and drinks. Laughs Unlimited got started way back in 1980 and has always been a reliable destination for people in need of a good time. The likes of Jerry Seinfeld, Jay Leno, Dana Carvey, Gallagher, Bob Saget, and more have all appeared on the Laughs Unlimited stage and many up-and-coming talents feature here every single week. Established in 2008 and part of the nationwide brand of improv comedy clubs, ComedySportz Sacramento specializes in improv comedy. At this venue, two teams of improv comedians are pitted against each other every night in a series of challenges, many of which are devised by audience members, to see which team can get the best and biggest laughs from the crowd. The comedy at this club is always clean, so younger audience members are welcome to attend, and the dynamic nature of improv comedy ensures that every evening is totally different to the last. Theater is a big part of Sacramento's culture, with dozens of different productions being performed on any given night, so the smart folks behind STAB! decided to take that inherent love of theater and add a comedic edge to it. The STAB! 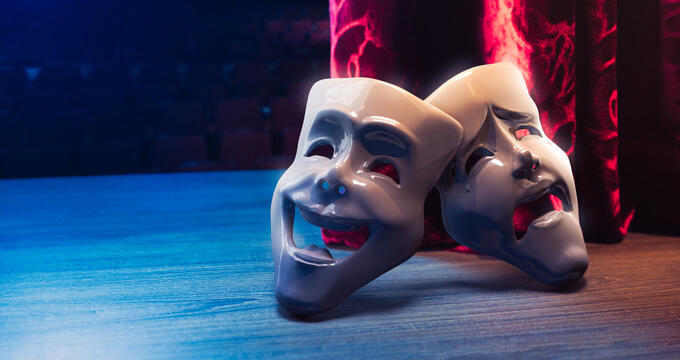 Comedy Theater features forward-thinking, diverse comedy stage productions and offers something completely different to most traditional stand up or improv comedy shows you'd expect to find in many other major cities around the nation. So if you're looking for a comedy show with a difference and a little extra originality, this is the place to be.